The expansion of the Royal Australian Navy and the Australian Naval Shipbuilding plan offers a once in a generation opportunity to maximise Navy presence on the east coast. The NSW defence industry, in particular the operations of Garden Island Defence Precinct, are essential to ongoing Naval operations. Major defence industry players including Thales, Sonartech Atlas, Rolls-Royce Australia, Forgacs Marine and defence are co-located here in NSW, providing critical support to the Navy. They are supported by a wide range of NSW Defence industry participants, large and small, from across the state, support of the RAN’s fleet assets, including the men and women who serve on them. Delivering Australia’s current and future naval capability is a national endeavour requiring a stronger Defence partnership with State and Territory Governments and the involvement of competitive Australian companies across national supply chains. NSW already makes a significant contribution to Defence, drawing on a range of industry capabilities, that supports Navy’s substantial presence in NSW. A significant maritime industry exists in NSW, including Garden Island Defence Precinct in Sydney. Garden Island is the homeport for Navy’s major fleet units on the East Coast and includes the Captain Cook Graving Dock, a major maintenance asset. 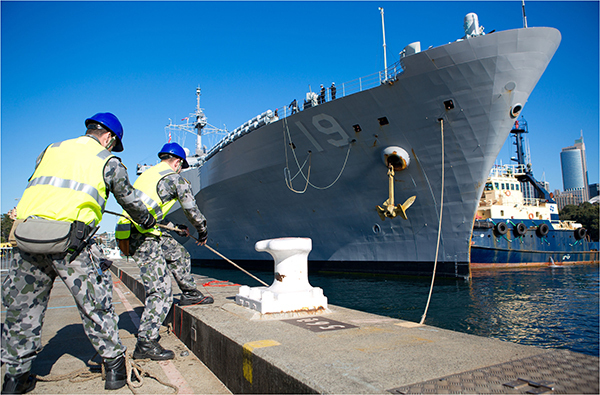 NSW businesses participate fully in the maritime sustainment sector, providing services such as ship repair and refurbishment. The Navy’s presence in and around Sydney Harbour is a highly complex network of interlinked facilities. NSW businesses supply major components such as cranes, navigation systems, sonar, electronic warfare equipment and steering components as well sustainment support to both Navy and civilian clients. Pacific 2017, of which the NSW Government was the major sponsor, brought leading national and international defence decision makers to Sydney and was an appropriate venue to reaffirm NSW Government support for the maritime industry sector. The government recently made a significant financial contribution to support the rebuild of the Fitzroy Street shipyard slipway at the Port of Newcastle. Once slipway repairs are complete, Thales Australia will establish a commercial ship repair facility at the Fitzroy Street site which is also earmarked for future vessel refurbishment, sustainment support for the Navy Mine Hunter vessels in order to return them to active service. The project will support up to 70 jobs. Fourteen of NSW’s leading aerospace and defence companies and organisations are being showcased to a global industry audience this week at the Australian International Airshow and Aerospace & Defence Exposition in Avalon.